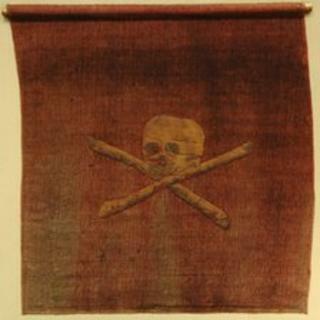 A rare 18th Century red Jolly Roger pirate flag has gone on display at Portsmouth's navy museum. The flag was captured in battle off the North African coast in 1780 by Lt Richard Curry, who later became an admiral. Pirates used skull and crossbones flags to frighten passing ships into surrendering without a fight. The flag is on show at the National Museum of the Royal Navy (NMRN) at Portsmouth Historic Dockyard. The red background - rather than black - signified the pirates intended to spare no life if a battle broke out during a ship's capture. When it was restored at the Winchester School of Art's Textile Conservation Centre in 2007, gunpowder and small holes with charred edges were found on the flag. The Jolly Roger has been loaned to the museum by its current owner Pamela Curry, a descendant of Lt Curry. The Jolly Roger is the most famous pirate flag. The skull and cross bones came from the symbol used in ships' logs, where it represented death on board. It was first used on a pirate flag around 1700 and quickly became popular. As piracy developed, more flags were used, and pirates often had their own versions, such as a skull and crossed swords. The title Jolly Roger is thought to come from the French phrase "joli rouge" which means "pretty red". Richard Noyce, curator of artefacts at the museum, said: "Pirates always attract much interest, no doubt in part due to the many Hollywood films about them. "However, in reality they weren't the loveable rogues they are often portrayed as. "Then, as now, pirates were seen as a threat to trade and great efforts were made to suppress their criminal activities." In the museum's new 20th and 21st Century galleries, set to open in 2014, it intends to show how the Royal Navy and Royal Fleet Auxiliary fought and continues to fight piracy that threatens international shipping lanes.